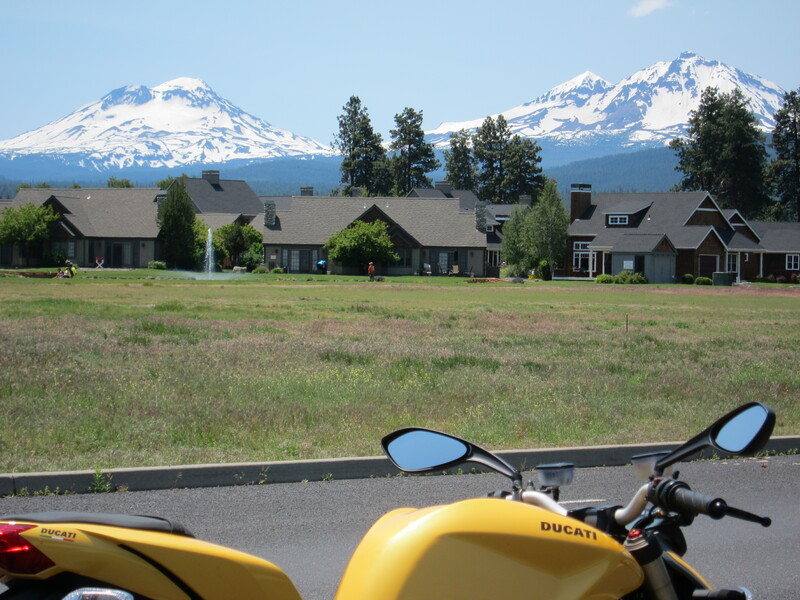 A July 4th holiday in the middle of the week + that McKenzie pass road that just opened for the season + the Sisters Coffee Company (because it is there at the end of the road) + that poisonous Ducati Streetfighter 848 = another lame excuse for a ride. Earlier this year I had noticed July 4th would fall on a Wednesday. 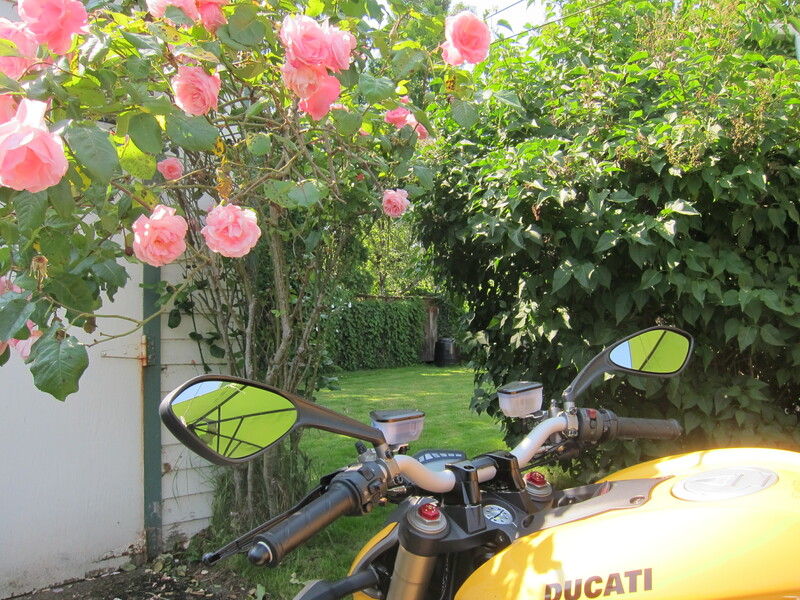 So I thought I could take Mon-Tue or Thu-Fri off and have a nice set of days for some vacation time, enjoying the summer weather for a nice long ride. But no, I had to find work, I had to volunteer for a project. And who in his/her sane mind would stipulate a deadline for July 9th? In the end I was lucky to still have the July 4th itself to enjoy some time off. 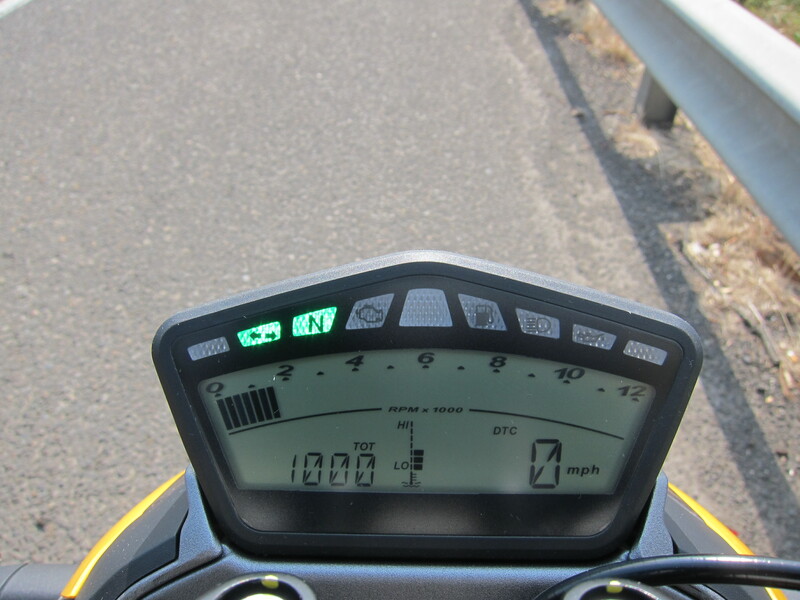 When July 4th arrived and the smart phone forecast applications had been displaying that fully clear yellow circle icon all over the state I was more than ready to go for a ride and enjoy a needed break from work. I wheeled the hooligan machine out of the garage, sorted my gear, checked oil level, tires pressure, and set out for the ride. The machine had 992 miles on the clock at the start of this trip, when it hit 1,000 I stopped by the side of the road to document it. 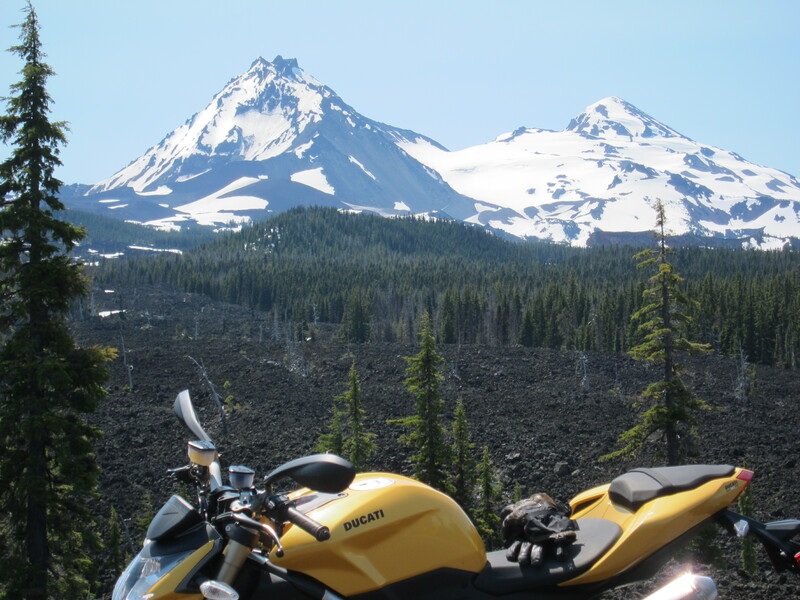 I had been checking information about Hwy 242, the McKenzie pass road, to figure out when would it open this season. It opened on June 21st, which can be considered normal, despite the mild winter. I don’t think we got substantial snow fall until it was almost February already. Below is a chart showing the open and close days for the McKenzie pass road since 1925. On most of the years the road opened somewhere in June and closed in November. 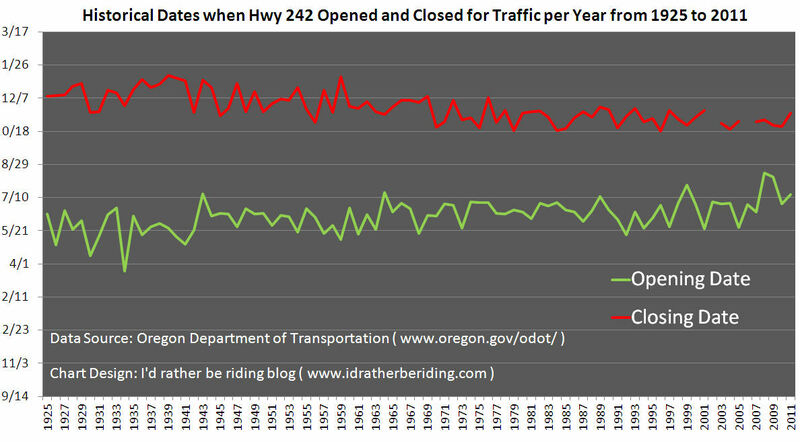 It seems the number of days the road is open are declining along the years. I looked at temperature and snow patterns and it does not appear to correlate very well with road opening and closures. That is, I could not observe a clear temperature decline or a clear snow fall increase along the years. Decisions about opening the road may include other aspects related to road use, road maintenance and availability of resources besides snow accumulation. I’ve been to this road many times. 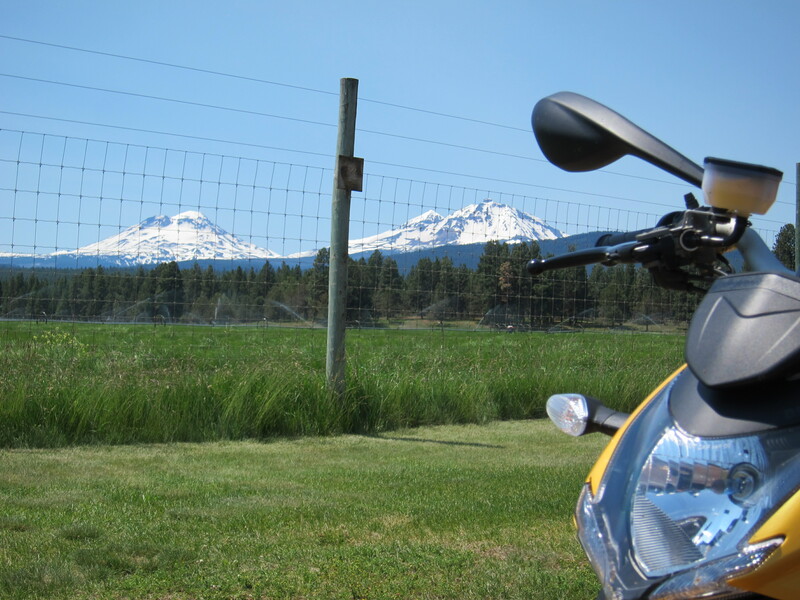 It is a favorite for the riding experience and the views. The first time I had been on this road was in January of 2006, fresh off the “boat” from my move from Ohio, when I was exploring the area for the first time. I was driving the Audi, still with Ohio plates. Just a couple of months later in 2006 I would be buying the BMW Dakar and would then start to explore Oregon the right way. 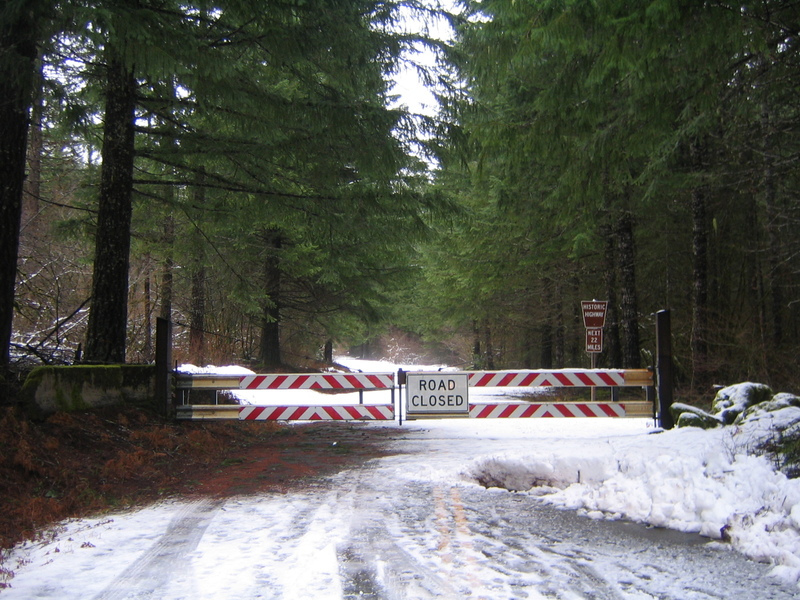 In that January of 2006 the road was closed, as would be expected for that time of the year. Until the late 1950’s this road segment, which was part of today’s Hwy 126, was one of the main roads connecting Eugene to the east side of the Cascades. 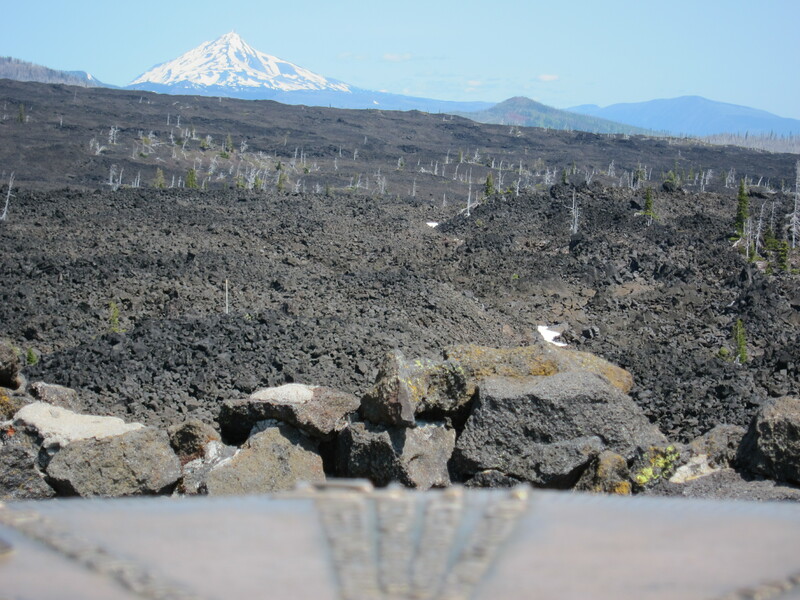 In 1964, after Hwy 20 was completed over the South Santiam pass, just a few miles north of the McKenzie pass, this portion of the 126 was renamed to Oregon Route 242 and became a scenic highway. The plan for this July 4th ride was simple: ride the recently opened Route 242, have a cup of coffee in Sisters and come back home. 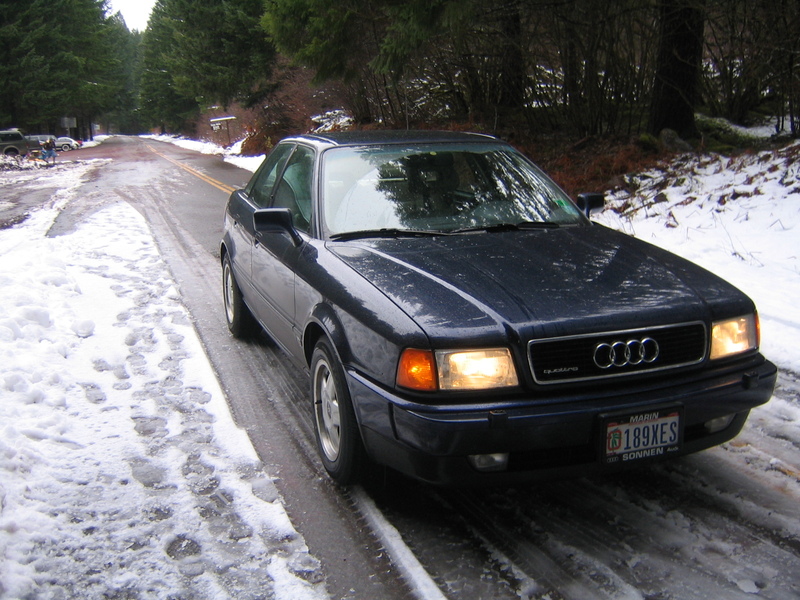 Leaving the house, I took hwy 105 to 126 to get to the Oregon Route 242. 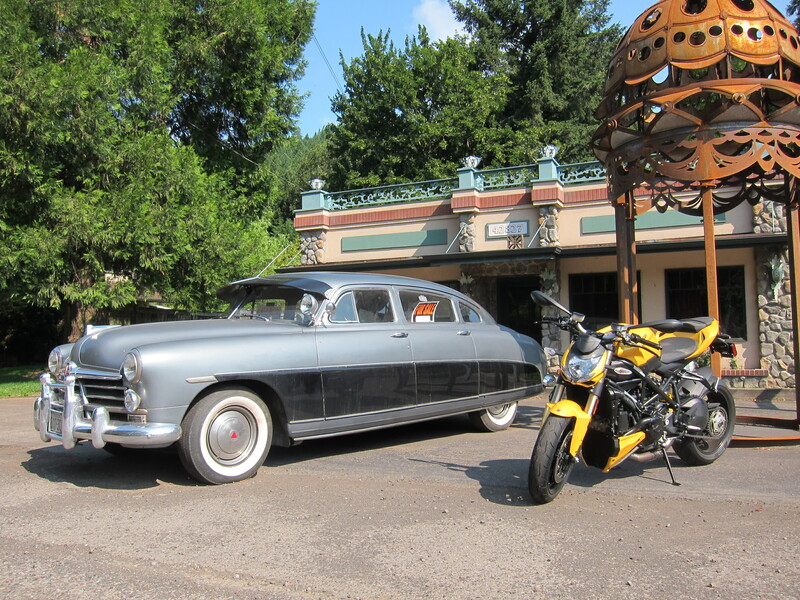 Once on 126, at some point I came across a Hudson parked on the side of the road. I made a u-turn to check it out. When my father bought his first brand new car, the VW 1300 (check this other post for the story), I remember that car was involved on a fender bender with a Hudson, and I was in the car with the rest of the family when it happened. We had a neighbor a few doors down the street, who lived at the side of our neighborhood market. 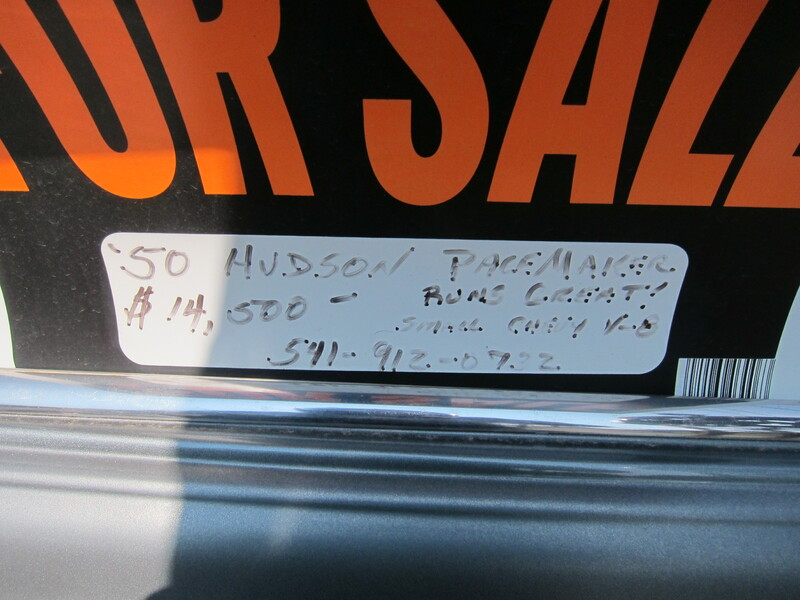 He probably was older than my father is today, and I remember his car, an already old for that time Hudson. Not unlike the one pictured here. What I remember is that one day my father had made a quick stop at the market to pick milk or something to that order, before we got home. Just after that this neighbor was backing out of his driveway, did not see us, lightly hitting the fender of our brand new VW that was parked across the street. It was not much of a bend to the drivers’ side fender, but the car was brand new when it happened. Nothing happened to the Hudson, of course. The Hudson owner covered the expenses to get the VW fixed, I remember my father going to his house to get the check. The things we don’t forget. 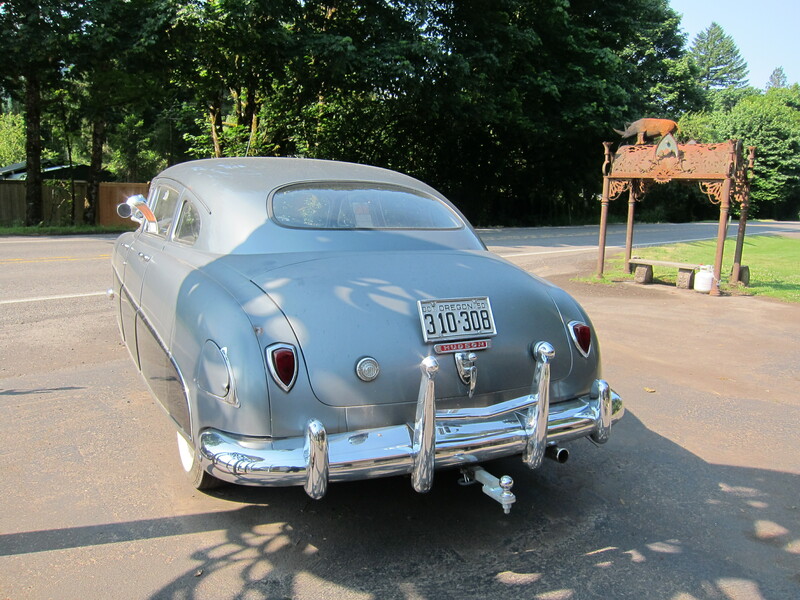 The Hudson was an unusual type of car, with that long, declining roof line, almost hatchback style, and the body panels partially covering the rear wheel. This car has many blind spots for someone backing out, no wonder our neighbor missed us. I just can’t remember what was this neighbor’s name. Back to the story, in contrast with the rest of the nation, Spring in this area of the state has been long and the Summer reluctant to show up. Everywhere else in the country people have been complaining about hot weather, record breaking temperatures in some places in the east. In Colorado, New Mexico and other west states there have been vast forest fires. And here in Oregon things have been calm and cool and somewhat wet up to the last week of June leading into the holiday. When I left the house, the thermometer indicated a rather cool 57 F (about 14 Celsius). 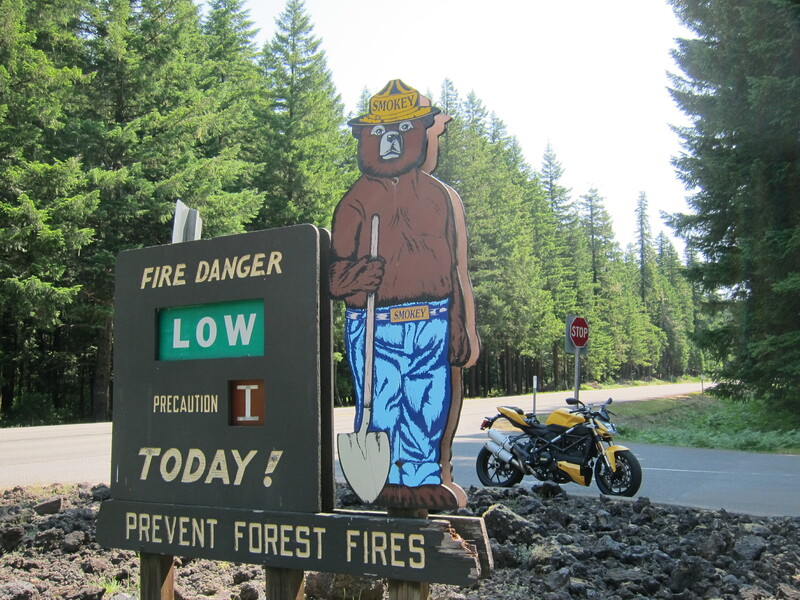 And on Hwy 126, Mr. Smokey the Bear was not talking about danger for forest fires at this time. 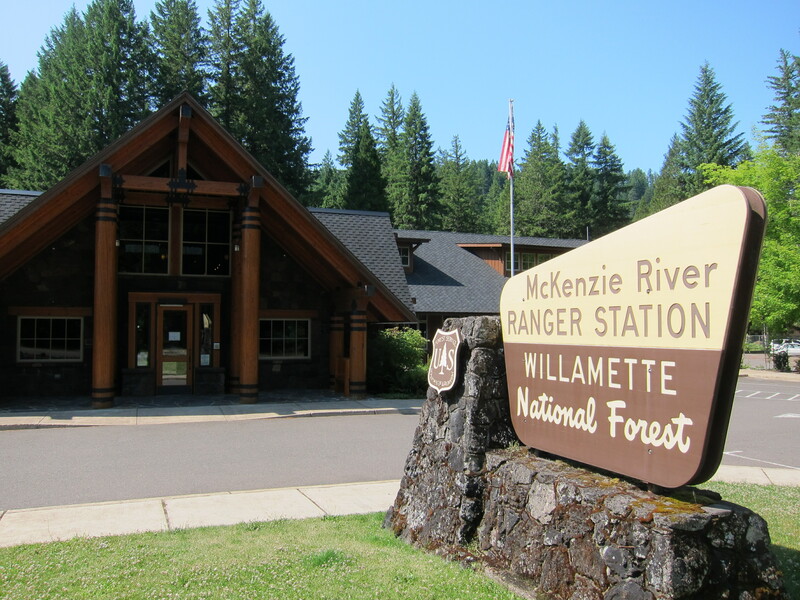 I had never stopped by this ranger station before. Nice building. I stopped for fuel at the Harbick Country Store. The cute girl attending the gas station gave me a second look (I never removed the helmet :), of course). 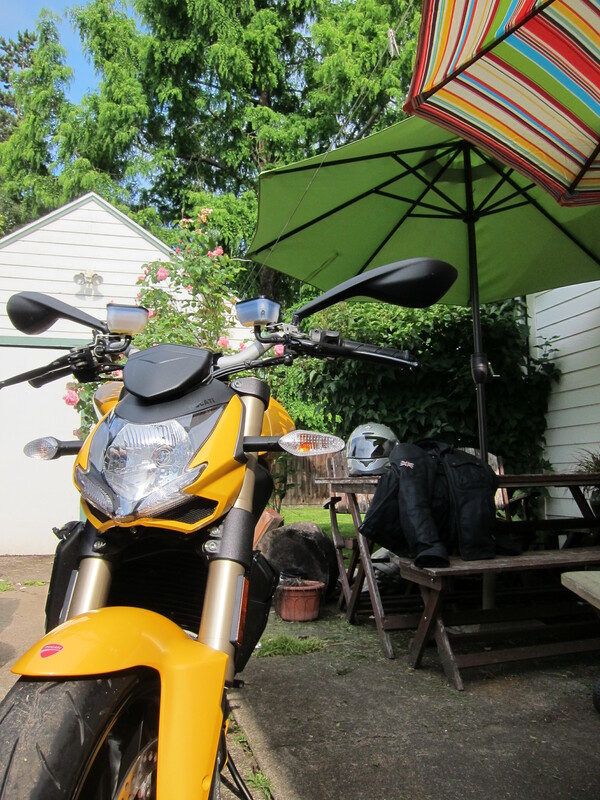 Being my ambassador is one of this yellow Ducati’s qualities. Back on the road, soon I was at the start of 242. In September of last last year I spent several hours stopped right here trying to fix a flat tire in the BMW Dakar (here is that story). This time it was just a stop for pictures. And to confirm the road was really open! 242 opened on June 21st. I got going on 242 and found that traffic was light. Great! Since the road was just recently opened, I was expecting more debris and gravel on the surface but was surprised by how clear and smooth it was. This road is important enough for tourism to be well maintained, I realize. 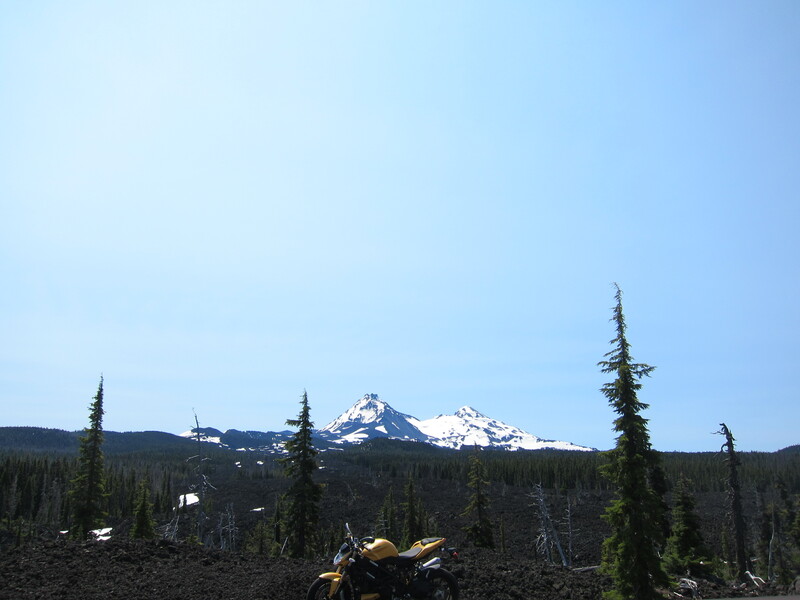 Soon I was on the pass surrounded by volcanic rock and the nice view of the Sisters mountains. Here is a short video with a compilation of the several stages of the climb. You start on the lush and vibrant green and tall trees on the west side, and as you climb, the green gradually fades, the trees get shorter, until you finally reach the lava fields on the top (the quality of this video is low, as I edited it with a free and lame windows movie editor). This is the view from where I parked the bike. 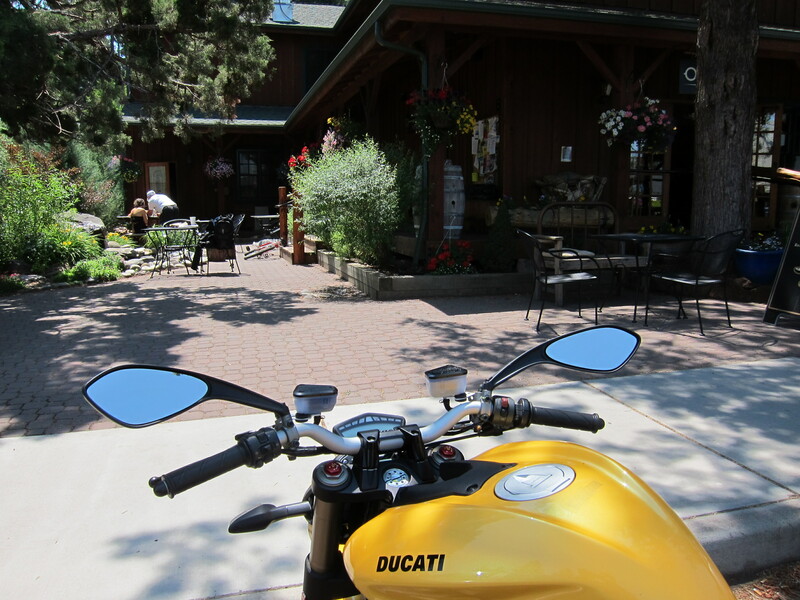 Of course, the view is always nicer when the Ducati is part of it. 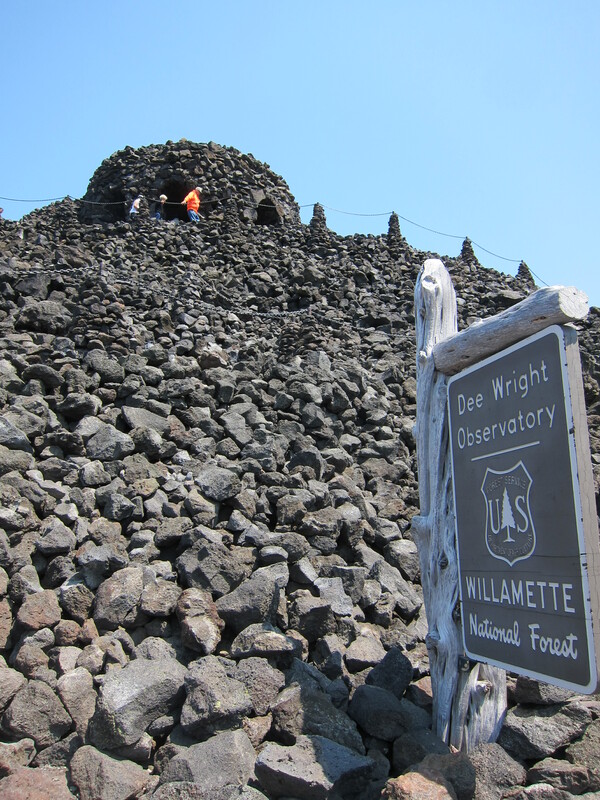 One mile farther from this point you get to the Dee Wright observatory on the McKenzie pass summit. 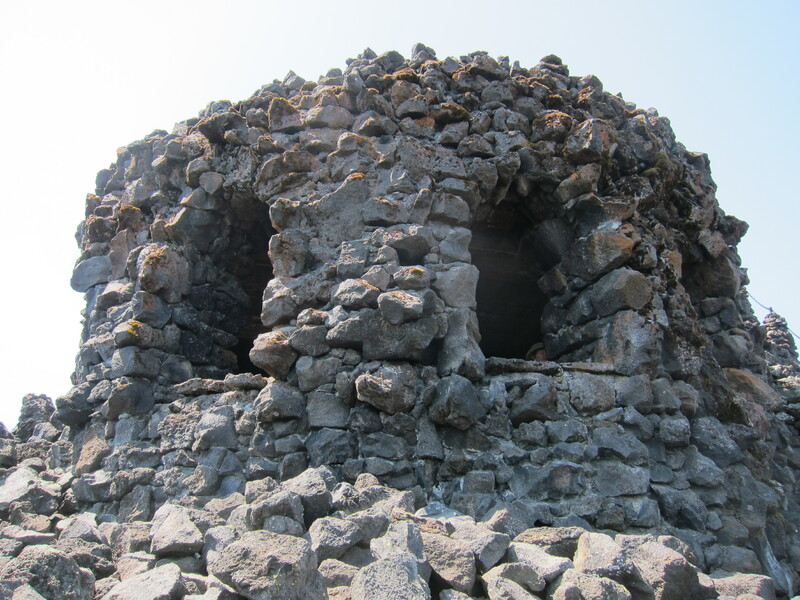 The observatory is built with volcanic rocks and it is a nice visual guide to the mountains and volcanoes in this area of the Cascades. 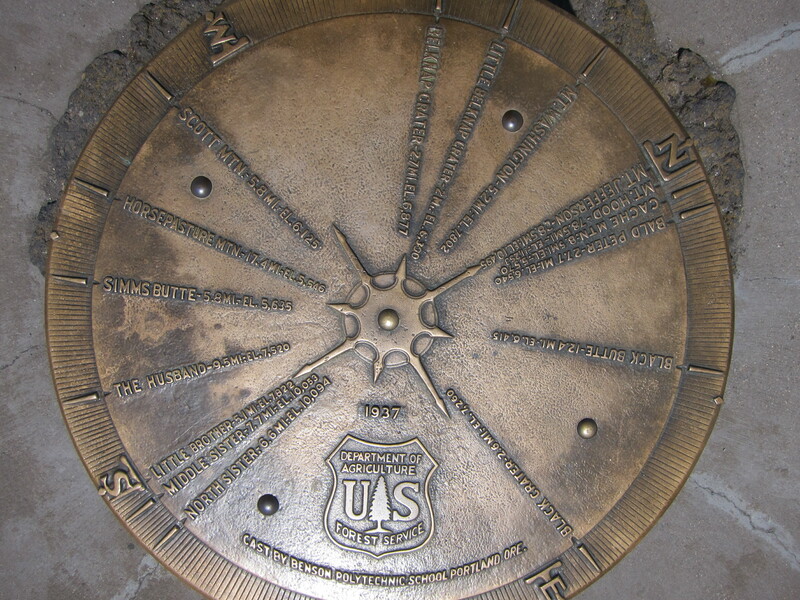 On the very top of the observatory you find this compass cast in bronze with the direction, distance and the height of volcanoes and mountains that, on clear days, are visible with a naked eye from this point. You just follow the arrow and you find the mountains. And here they are as viewed from there. Mt. 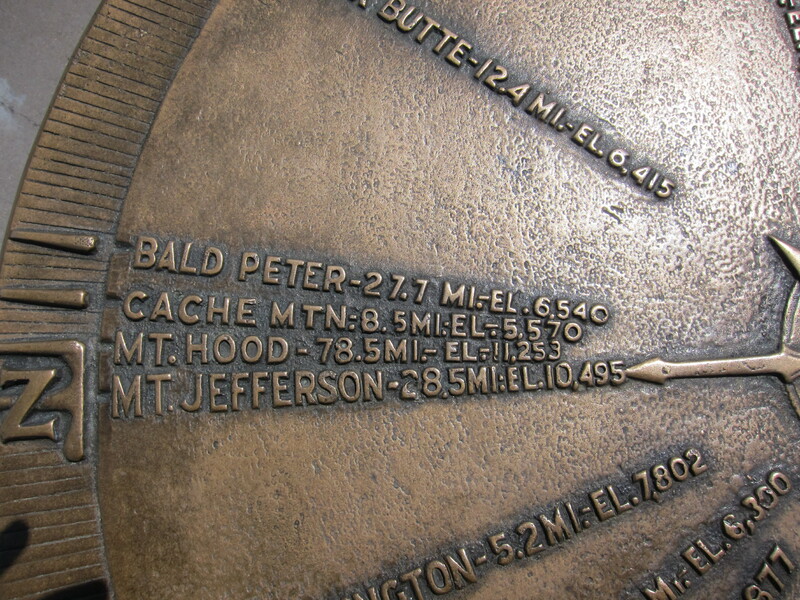 Hood, which is 78.5 miles away (126km) is barely visible on the right of Mt. Jefferson. It is that very small white triangle on the right side of Mt. Jefferson slope below its snow level. If I had a better zoom lens, and the day was a bit clearer, it would be possible to document it better here. Not all these volcanoes are extinct. Mt. St. Helen, not visible from here, had a major eruption on May 1980. Mt. St. Helen’s latest eruption was in 2006, I believe. Mt. Hood was last active in 1865. 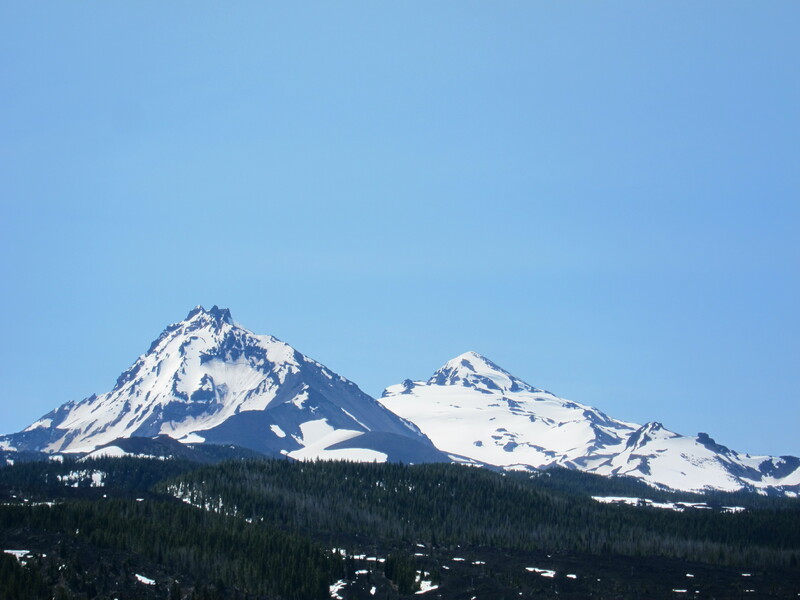 The Sisters volcano was last active on year 950, give or take, according to the United States Geological Survey site (USGS). The lower part of the observatory has large windows and smaller windows. The smaller ones point to each of the mountains as well. 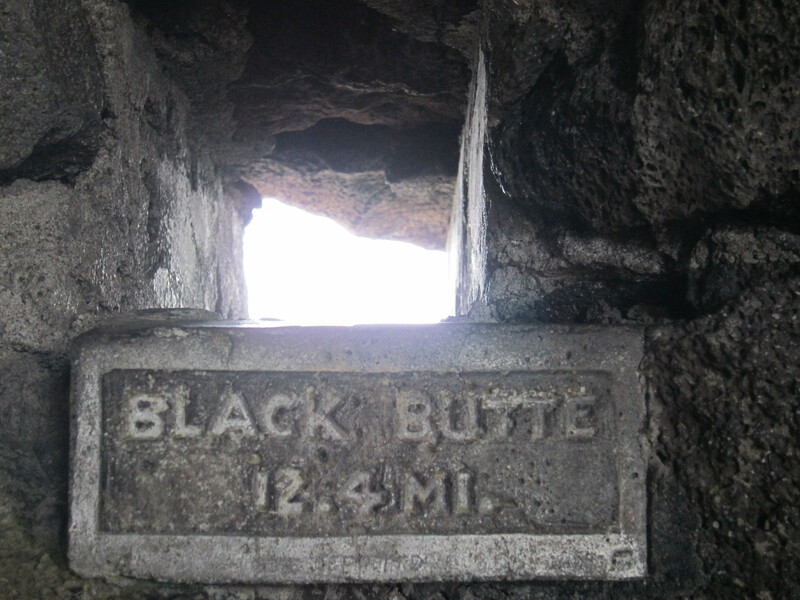 Below is the window pointing to the Black Butte, 12.4 miles away. 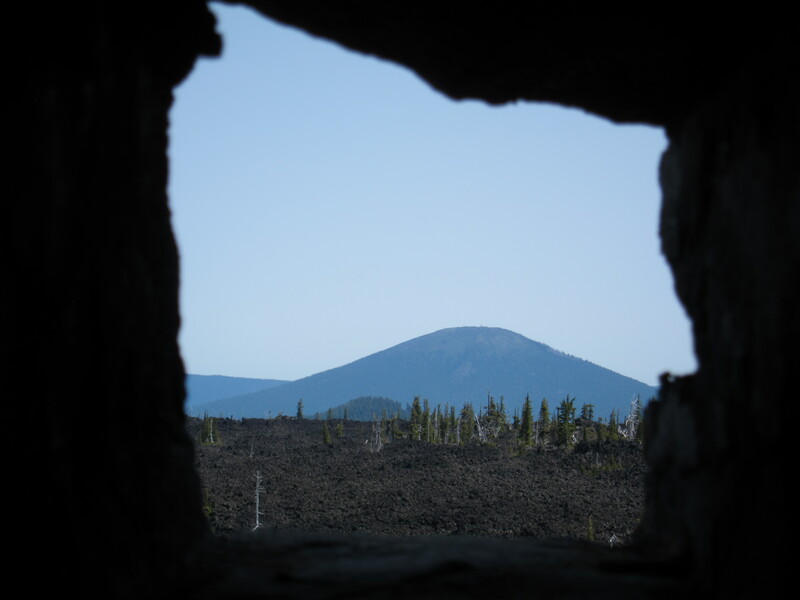 Black Butte as viewed from Dee Wright Observatory. 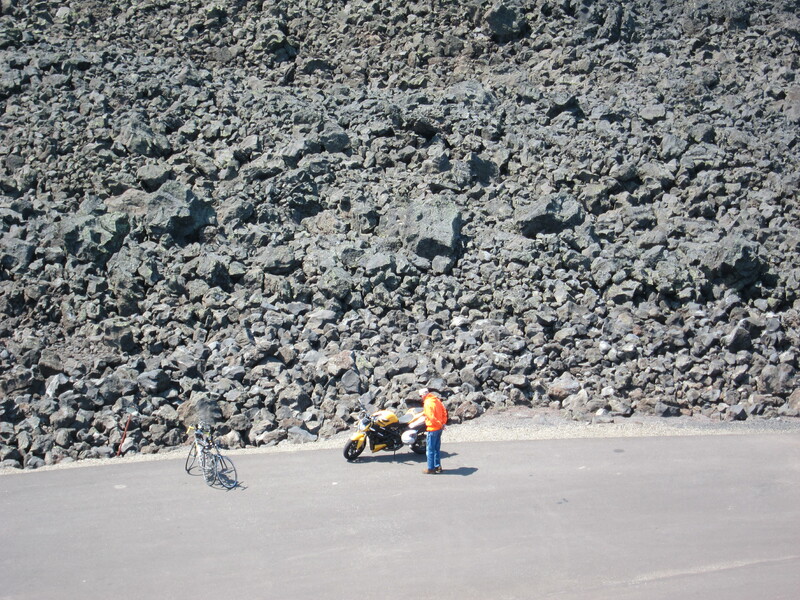 And below is the Ducati in the middle of the lava field as viewed from the top of the observatory. The ambassador attracts everyone’s attentions. You will find bicyclists riding in large numbers on the road. It must be quite the work out to climb this road from the west side. But it must be a lot of fun going to back down from east to west. The pass is not at too high an elevation at 5,325 ft (1,623 meters) above sea level. 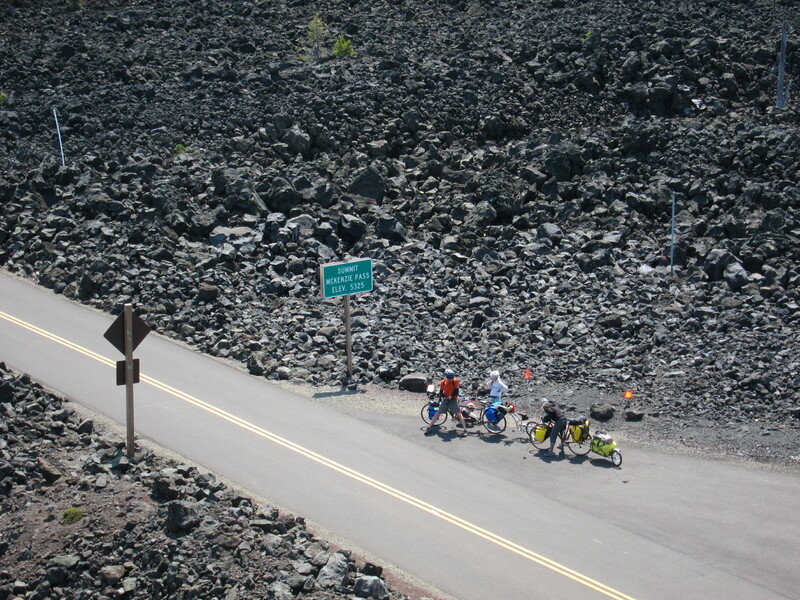 Mckenzie pass elevation = 5,325 ft or 1,623 meters above sea level. I got back on the bike and continued a few miles in the the direction of Sisters and stopped again to check another view. 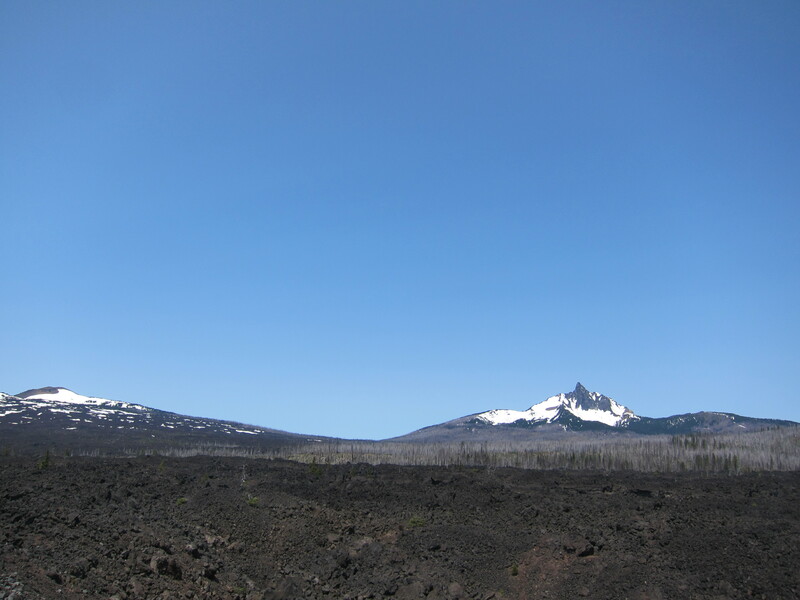 And here is what it looks like, with Belknap Crater (on left) and Mt. Washington (right of center) as background. 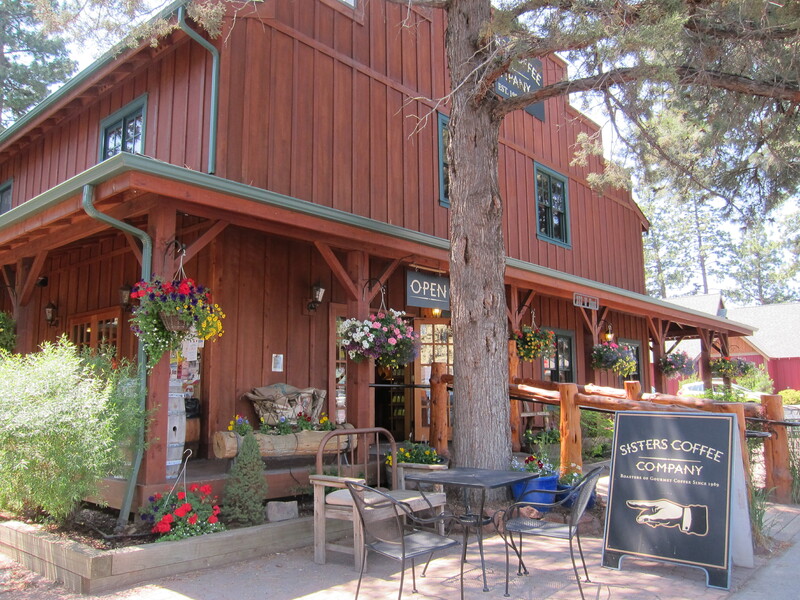 Back on the bike, quickly I found myself going through the Ponderosa trees, and a few more miles I was down in Sisters. Less than a mile llater I was at my final destination. Why this destination? Just because it is there, practically at the end of the road. I had a croissant and a banana bread, a cup of coffee, and was back on the road, following the same route back home. 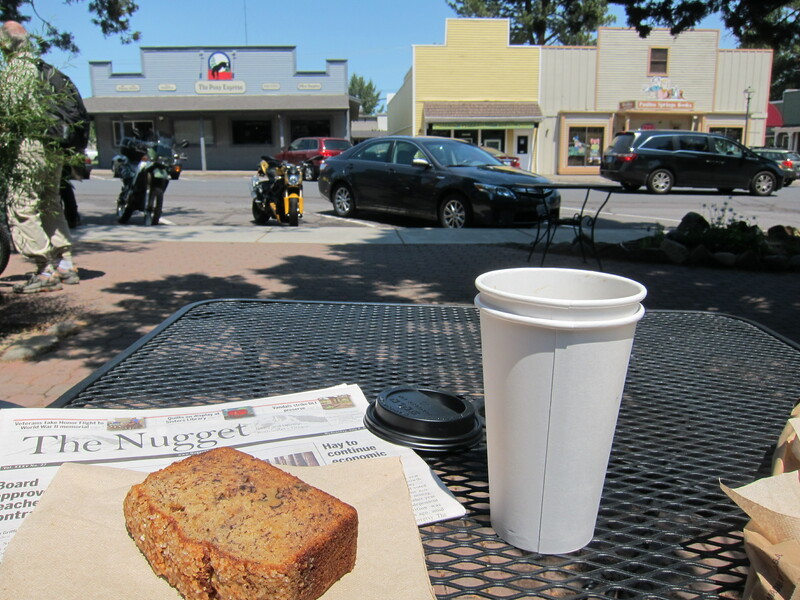 The Nugget, a slice of Banana Bread (a bit on the dry side), and a Cup of Coffee. I would not consider this place a destination for the quality of the food. But the location is great, summer weather here is perfect for sitting outside. It is just a pleasant place to be and rest for a while. Soon I was back on the bike. Just a few blocks from the Café you see these houses. Not a bad place to live if this is the view they have from their backyards. 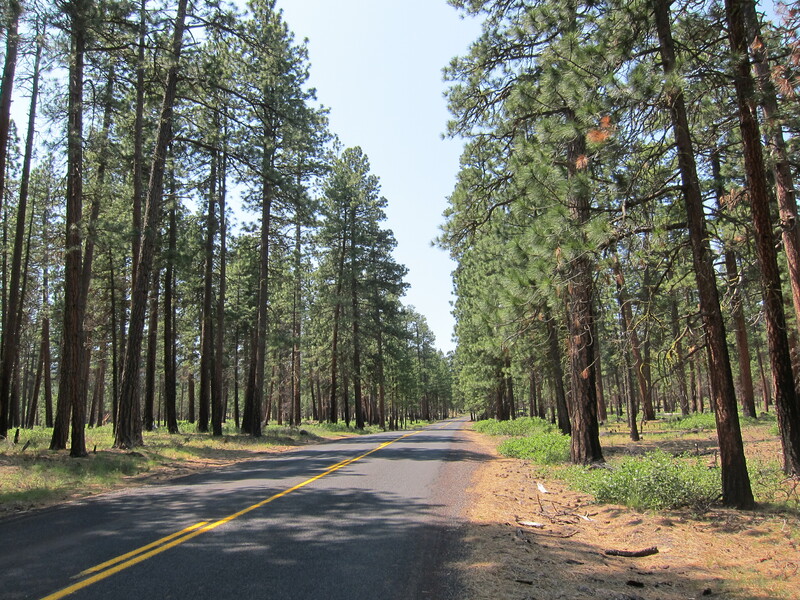 And less than a mile later I was back on 242 and the Ponderosa trees. Oregon Route 242 as viewed when just leaving Sisters. 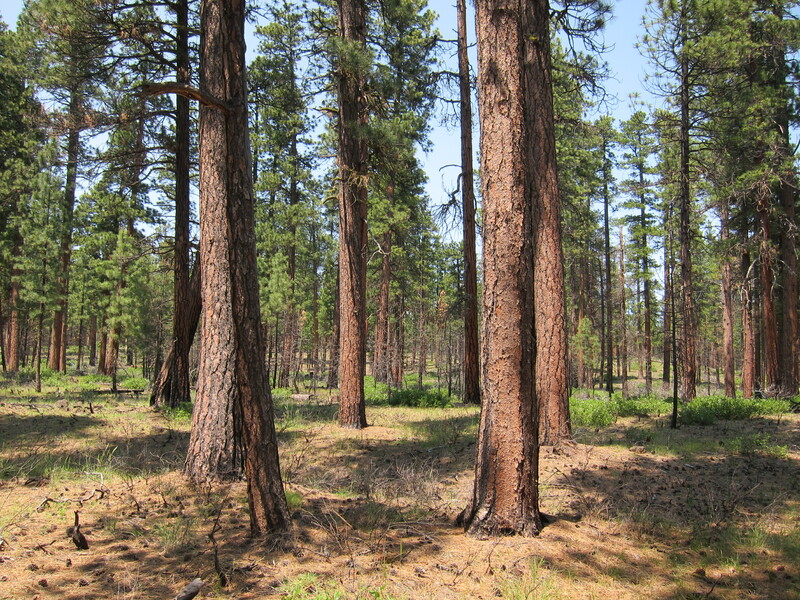 By the way, these trees are found in the transition from wet to dry areas of the state, just east of the Cascades, from north to south. They have cinnamon color trunks and riding through a forest of these trees you feel a characteristic smell, something nice and sweet, similar to vanilla, that emanates from these trees. Back on the road, I have this clip of the short climb from Sisters to the summit. In the end, once down from Route 242 I took the long way back home, I went right and took Hwy 20 towards Hwy 99 to Praire road. At the end of this trip, the bike had 1238 miles on the clock, for a total of 246 miles (386km) for the day. The motor is getting considerably smoother, fueling is getting much better, and the joy of riding it is increasing by the ride. I’m understanding better the ergonomics and getting a lot more comfortable with its output. Next, I will take it to Winchester Bay. But first, on the way to Winchester Bay, she will take me on an adventure. 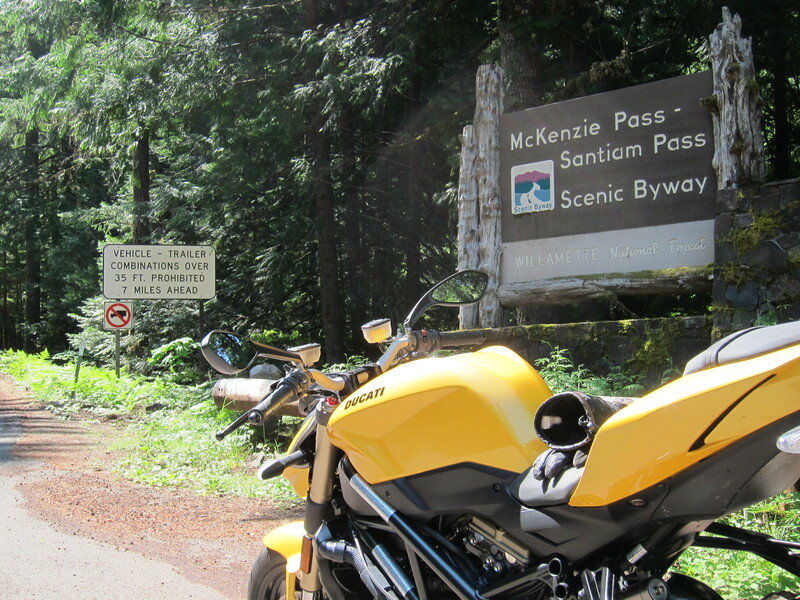 This entry was posted in Riding the Ducati and tagged Ducati, mckenzie pass, oregon cascades, sisters coffee company, Streetfighter 848. Bookmark the permalink. aproveita o calorzinho daí…. aqui tá danado. Chegamos nesta semana da quente Europa e estou indo agora a Bagé…. E aí, como estava a Espanha? Viu aquela final da UEFA, Espanha x Italia em alguma praça, na rua, com uma cerveja gelada? A comemoração deve ter sido grande. Aproveita Bage’ e se encontrares o Carlos Alberto ou algum outro parente meu peço o favor de mandares um abraço meu. That’s so lame… NOT! César, what a great ride. Thanks for sharing. 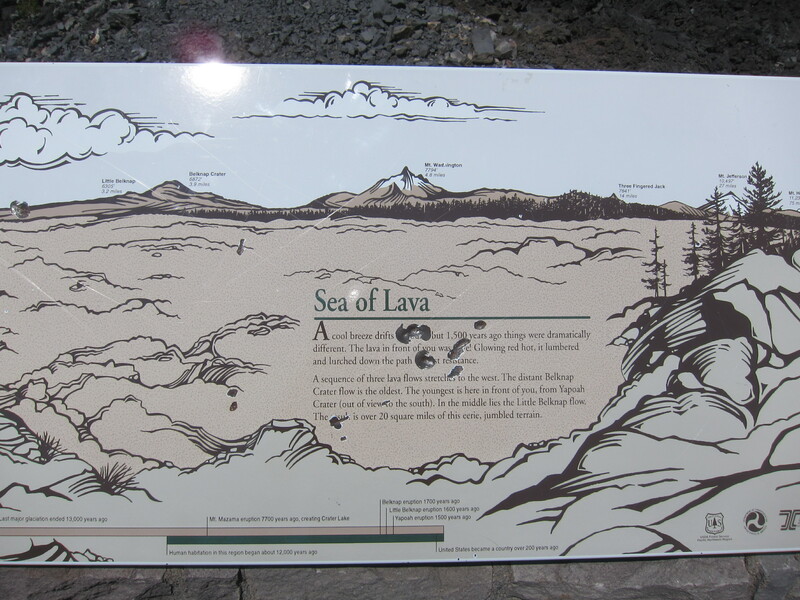 For me, the closet geologist, those lava fields are quite intriguing. And. of course I enjoy your pics (and the clever positioning of the Duc), probably as much as you did when taking them. You are a lucky guy, blessed with some of the probably best roads in the country. Keep it coming, mate. That Ducati finds its the way on the majority of my pictures. And yes, it is great here in Oregon, and I haven’t seen all roads yet. But your area is also very nice. I enjoyed your pictures on the scooters ride. 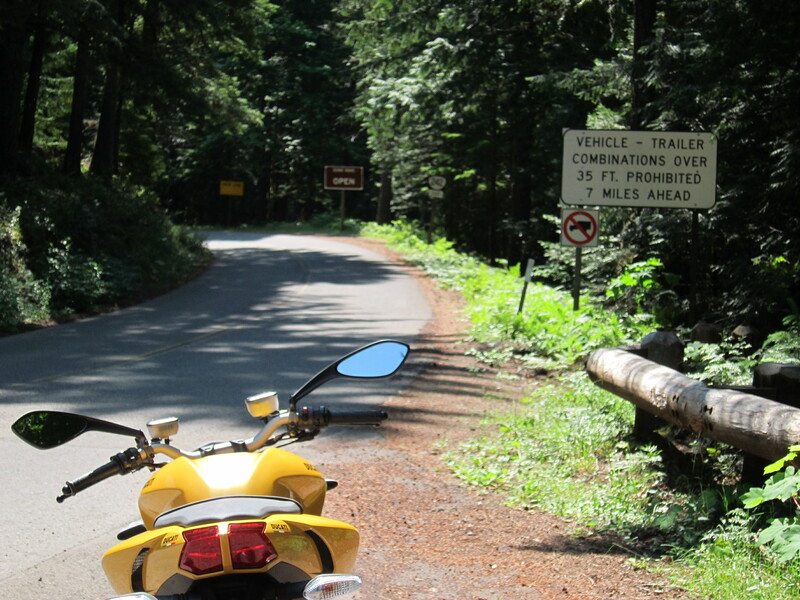 This entire west coast area is beautiful with many nice motorcycling roads, but we shouldn’t be advertising much. I know, I’m not doing a great job on keeping things quiet. we tried to go on Route 242 a few years ago but it was closed due to a rock slide or something like that. We did go down that road a few miles, then had to turn around, I’m guessing about 4 or 5 years ago. Hmm, Winchester day . . . you mean your Duc is going to climb the sand dunes ? I remember that rock slide not too long ago on 242, in 2007 ODOT worked on stabilizing the area with the steep switchbacks. In 2009 the road was re-paved, and although it became narrower after the re-pavement, it is so much nicer now. But don’t tell anyone about it. And the bike’s yellow looks much better in person, BTW. The Ducati took a close look at the sand dunes in Winchester Bay. But it did not venture out on the sand. The adventure was much milder than that, but I can say the Ducati was where I don’t think many sport bike owners take their bikes.